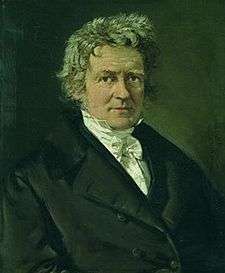 Friedrich Wilhelm Bessel (German: [ˈbɛsəl]; 22 July 1784 – 17 March 1846) was a German astronomer, mathematician, physicist and geodesist. He was the first astronomer who determined reliable values for the distance from the sun to another star by the method of parallax. A special type of mathematical functions were named Bessel functions after Bessel's death, though they had originally been discovered by Daniel Bernoulli. Bessel was born in Minden, Westphalia, administrative center of Minden-Ravensberg, as second son of a civil servant. He was born into a large family in Germany. At the age of 14 Bessel was apprenticed to the import-export concern Kulenkamp at Bremen. The business's reliance on cargo ships led him to turn his mathematical skills to problems in navigation. This in turn led to an interest in astronomy as a way of determining longitude. Bessel came to the attention of a major figure of German astronomy at the time, Heinrich Wilhelm Olbers, by producing a refinement on the orbital calculations for Halley's Comet in 1804, using old observation data taken from Thomas Harriot and Nathaniel Torporley in 1607. Two years later Bessel left Kulenkamp and became Johann Hieronymus Schröter's assistant at Lilienthal Observatory near Bremen. There he worked on James Bradley's stellar observations to produce precise positions for some 3,222 stars. In January 1810, at the age of 25, Bessel was appointed director of the newly founded Königsberg Observatory by King Frederick William III of Prussia. On the recommendation of fellow mathematician and physicist Carl Friedrich Gauss he was awarded an honorary doctor degree from the University of Göttingen in March 1811. Around that time, the two men engaged in an epistolary correspondence. However, when they met in person in 1825, they quarrelled; the details are not known. In 1842 Bessel took part in the annual meeting of the British Association for the Advancement of Science in Manchester, accompanied by the geophysicist Georg Adolf Erman and the mathematician Carl Gustav Jacob Jacobi. Bessel married Johanna, the daughter of the chemist and pharmacist Karl Gottfried Hagen who was the uncle of the physician and biologist Hermann August Hagen and the hydraulic engineer Gotthilf Hagen, the latter also Bessel's student and assistant from 1816 to 1818. The physicist Franz Ernst Neumann, Bessel's close companion and colleague, was married to Johanna Hagen's sister Florentine. Neumann introduced Bessel's exacting methods of measurement and data reduction into his mathematico-physical seminar, which he co-directed with Carl Gustav Jacob Jacobi at Königsberg. These exacting methods had a lasting impact upon the work of Neumann's students and upon the Prussian conception of precision in measurement. Bessel had two sons and three daughters. His eldest daughter, Marie, married Georg Adolf Erman, member of the scholar family Erman. One of their sons was the renowned Egyptologist Adolf Erman. After several months of illness Bessel died in March 1846 at his observatory from retroperitoneal fibrosis. While the observatory was still in construction Bessel elaborated the Fundamenta Astronomiae based on Bradley's observations. As a preliminary result he produced tables of atmospheric refraction that won him the Lalande Prize from the French Academy of Sciences in 1811. The Königsberg Observatory began operation in 1813. Starting in 1819, Bessel determined the position of over 50,000 stars using a meridian circle from Reichenbach, assisted by some of his qualified students. The most prominent of them was Friedrich Wilhelm Argelander. With this work done, Bessel was able to achieve the feat for which he is best remembered today: he is credited with being the first to use parallax in calculating the distance to a star. Astronomers had believed for some time that parallax would provide the first accurate measurement of interstellar distances—in fact, in the 1830s there was a fierce competition between astronomers to be the first to measure a stellar parallax accurately. In 1838 Bessel won the race, announcing that 61 Cygni had a parallax of 0.314 arcseconds; which, given the diameter of the Earth's orbit, indicated that the star is 10.3 ly away. Given the current measurement of 11.4 ly, Bessel's figure had an error of 9.6%. Nearly at the same time Friedrich Georg Wilhelm Struve and Thomas Henderson measured the parallaxes of Vega and Alpha Centauri. As well as helping determine the parallax of 61 Cygni, Bessel's precise measurements using a new meridian circle from Adolf Repsold allowed him to notice deviations in the motions of Sirius and Procyon, which he deduced must be caused by the gravitational attraction of unseen companions. His announcement of Sirius's "dark companion" in 1844 was the first correct claim of a previously unobserved companion by positional measurement, and eventually led to the discovery of Sirius B.
Bessel was the first scientist who realized the effect later called personal equation, that several simultaneously observing persons determine slightly different values, especially recording the transition time of stars. In 1824, Bessel developed a new method for calculation the circumstances of eclipses using the so-called Besselian elements. His method simplified the calculation to such an extent, without sacrificing accuracy, that it is still in use today. Bessel's work in 1840 contributed in some degree to the discovery of Neptune in 1846 at Berlin Observatory, several months after Bessel's death. On Bessel's proposal (1825) the Prussian Academy of Sciences started the edition of the Berliner Akademische Sternkarten (Berlin Academic Star Charts) as an international project. One unpublished new chart enabled Johann Gottfried Galle to find Neptune near the position calculated by LeVerrier in 1846. In the second decade of the 19th century while studying the dynamics of 'many-body' gravitational systems, Bessel developed what are now known as Bessel functions. Critical for the solution of certain differential equations, these functions are used throughout both classical and quantum physics. Bessel is responsible for the correction to the formula for the sample variance estimator named in his honour. This is the use of the factor n − 1 in the denominator of the formula, rather than just n. This occurs when the sample mean rather than the population mean is used to centre the data and since the sample mean is a linear combination of the data the residual to the sample mean overcounts the number of degrees of freedom by the number of constraint equations — in this case one. See Bessel's correction. An additional field of work was geodesy. Bessel published a method for solving the main geodesic problem. He was responsible for the survey of East Prussia which joined the Prussian and Russian triangulation networks and he obtained an estimate of increased accuracy for the figure of the Earth, nowadays referred to as the Bessel ellipsoid. Despite lacking a university education, Bessel was a major figure in astronomy during his lifetime. He was elected as member of the Prussian Academy of Sciences in 1812, the French Academy of Sciences in 1816, foreign member of the Royal Swedish Academy of Sciences in 1823, and fellow of the Royal Society in 1825. In 1832, he was elected a Foreign Honorary Member of the American Academy of Arts and Sciences. In 1827 Bessel became member of the Royal Institute of the Netherlands, predecessor of the Royal Netherlands Academy of Arts and Sciences. Bessel won the Gold Medal of the Royal Astronomical Society twice in 1829 and 1841. The largest crater in the Moon's Mare Serenitatis and the asteroid 1552 Bessel were named in his honour. Astronomische Beobachtungen auf der Königlichen Universitäts-Sternwarte zu Königsberg. I. (1815) — XXI. (1844). Astronomische Untersuchungen. 2 Vol. Königsberg 1841,1842. Vol. 3: VI. Geodäsie. VII. Physik. VIII. Verschiedenes – Literatur. Leipzig 1876. ↑ Olesko, Kathryn M. (1991). Physics as a Calling: Discipline and Practice in the Königsberg Seminar for Physics. Cornell University Press. ↑ "Bessel's Tod" [Bessel's death]. Astronomische Nachrichten (in German). 24 (556): 49–52. 1846. Bibcode:1846AN.....24...49B. doi:10.1002/asna.18460240402. ↑ Bessel, F. W. (1838). "Bestimmung der Entfernung des 61sten Sterns des Schwans" [Determination of the distance to 61 Cygni]. Astronomische Nachrichten (in German). 16 (365–366): 65–96. Bibcode:1838AN.....16...65B. doi:10.1002/asna.18390160502. ↑ Bessel, F. W. (1838b). "On the parallax of 61 Cygni". Monthly Notices of the Royal Astronomical Society. 4 (17): 152–161. Bibcode:1838MNRAS...4..152B. doi:10.1093/mnras/4.17.152. ↑ "A brief history of light dates". National Geographic. Retrieved 14 August 2013. ↑ Bessel, F. W. (1844a). "Ueber Veränderlichkeit der eigenen Bewegungen der Fixsterne" [On Variations of the proper motions of the fixed stars]. Astronomische Nachrichten (in German). 22 (514): 145–160. Bibcode:1844AN.....22..145B. doi:10.1002/asna.18450221002. ↑ Bessel, F. W. (1844b). "Ueber Veränderlichkeit der eigenen Bewegungen der Fixsterne (Fortsetzung)" [On Variations of the proper motions of the fixed stars (continued)]. Astronomische Nachrichten (in German). 22 (515): 169–184. Bibcode:1844AN.....22..169B. doi:10.1002/asna.18450221202. ↑ Bessel, F. W. (1844c). "On the variations of the proper motions of Procyon and Sirius". Monthly Notices of the Royal Astronomical Society. 6 (11): 136–141. Bibcode:1844MNRAS...6R.136B. doi:10.1093/mnras/6.11.136a. ↑ Hoffmann, Christoph (2007). "Constant differences: Friedrich Wilhelm Bessel, the concept of the observer in early nineteenth-century practical astronomy and the history of the personal equation". British Journal for the History of Science. 40 (3): 333–365. doi:10.1017/s0007087407009478. ↑ Viik, T. (2006). F.W. Bessel and Geodesy (PDF). Struve Geodetic Arc 2006 International Conference: The Struve Arc and Extensions in Space and Time. August 13–15, 2006. Haparanda and Pajala, Sweden: Lantmäteriet, Gävle, Sweden, 2006. pp. 53–63. ↑ Bessel, F. W. (2010) . . Translated by C. F. F. Karney & R. E. Deakin. "The calculation of longitude and latitude from geodesic measurements". Astronomische Nachrichten. 331 (8): 852–861. arXiv:0908.1824 . doi:10.1002/asna.201011352. English translation of Astron. Nachr. 4, 241–254 (1825). Errata. ↑ Bessel, F. W.; Baeyer, J. J. (1838). Gradmessung in Ostpreussen und ihre Verbindung mit Preussischen und Russischen Dreiecksketten [The East Prussian Survey and its connection with the Prussian and Russian networks] (in German). Berlin: Dümmler. ↑ Bessel, F. W. (1837). "Bestimmung der Axen des elliptischen Rotationssphäroids, welches den vorhandenen Messungen von Meridianbögen der Erde am meisten entspricht" [Determination of the axes of ellipsoid that fits best to the existing measurements of meridian arcs]. Astronomische Nachrichten (in German). 14 (333): 333–346. Bibcode:1837AN.....14..333B. doi:10.1002/asna.18370142301. ↑ Bessel, F. W. (1841). "Ueber einen Fehler in der Berechnung der französischen Gradmessung und seinen Einfluß auf die Bestimmung der Figur der Erde" [Concerning an error in the calculation of the French survey and its influence on the determination of the figure of the Earth]. Astronomische Nachrichten (in German). 19 (438): 97–116. Bibcode:1841AN.....19...97B. doi:10.1002/asna.18420190702. ↑ "Book of Members, 1780–2010: Chapter B" (PDF). American Academy of Arts and Sciences. Retrieved 24 June 2011. ↑ "Friedrich Wilhelm Bessel (1784 - 1846)". Royal Netherlands Academy of Arts and Sciences. Retrieved 22 May 2016. Jürgen Hamel: Friedrich Wilhelm Bessel. Leipzig 1984 ISSN 0232-3516. Kasimir Ławrynowicz: Friedrich Wilhelm Bessel, 1784–1846. Basel, Boston, Berlin 1995, ISBN 3-7643-5113-6. Chisholm, Hugh, ed. (1911). "Bessel, Friedrich Wilhelm". Encyclopædia Britannica. 3 (11th ed.). Cambridge University Press. Gilman, D. C.; Thurston, H. T.; Colby, F. M., eds. (1905). "Bessel, Friedrich Wilhelm". New International Encyclopedia (1st ed.). New York: Dodd, Mead. "Bessel, Friedrich Wilhelm". The Nuttall Encyclopædia. 1907. Fricke, Walter (1970–80). "Bessel, Friedrich Wilhelm". Dictionary of Scientific Biography. 2. New York: Charles Scribner's Sons. pp. 97–102. ISBN 978-0-684-10114-9. O'Connor, John J.; Robertson, Edmund F., "Friedrich Bessel", MacTutor History of Mathematics archive, University of St Andrews .